I love Marie Force's characters - every single one of them. At first the story of the maid and the rich young man falling in love may sound a little cliche, but Force brings a great added story line in Maddie Chester's past. She's had a very rough life, and a small portion of the reason why lies with part of his family. She has some serious trust issues and struggles a lot with making ends meet. One of the shining joys in her life (and in the book) is her son. He really lights up every scene with his baby antics and smiling face. Mac runs into Maddie (literally) quite by accident and he can't get her out of his mind. She's not like any woman he's met - the kind that are usually after his money. If anything, Maddie wants nothing to do with him because of his money. Mac makes a few mistakes - but with very good intentions - and things start to go wrong. His family isn't all too keen on him dating Maddie because of the rumors about how she lives either. What really hits you the most in this book, and in all the other Marie Force I have read, are the relationships. Not just between our main characters, but the delicate web she manages to weave between everyone in the stories. They are each connected in some way, and on a small island town, those lines can get complicated but fun. P.S. This is free in ebook on Amazon and Barnes & Noble - so no reason not to try it!! I love how at the beginning how mad she gets at him and he doesn't understand why...its pretty funny. 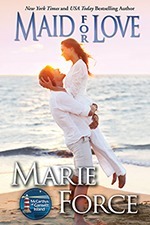 This was my first Marie Force book and I loved every moment. So many fun moments but boy did I have a hard time with his mother.